The Daniel Defense DDM4 V7 ($1,679) is the first rifle in the DDM4 lineup to feature the M-LOK® attachment technology with the Daniel Defense MFR 15.0 rail. Built around a Cold Hammer Forged, 16” barrel, the V7 has a DD improved Flash Suppressor to reduce flash signature. The mid-length gas system provides smooth and reliable cycling under any condition and reduces both perceived recoil and wear on moving parts. A free-floating MFR 15.0 handguard offers incredible weight savings as well as superior cooling, ergonomics, and modularity while maintaining the strength and durability expected from Daniel Defense. With the M-LOK attachment points that run along 7 positions and an uninterrupted 1913 Picatinny rail on top, the V7 has plenty of room for the sights, optics, and accessories the user may require. The rifle is finished off with the rugged and comfortable Daniel Defense Buttstock and Pistol grip. The Sig Sauer SRD556-QD Suppressor ($750) donated by Silencer Shop is an Inconel 718 suppressor using fast-attach muzzle devices to mount the suppressor to the rifle. Inconel 718, a nickel alloy stainless steel, provides the highest level of durability, particularly with short-barreled hosts using supersonic ammunition. This 5.56mm suppressor comes with a muzzle brake threaded in 1/2"x28tpi to match the vast majority of modern rifles in .223/5.56 on the market today. The rear mount has wrench flats to torque the suppressor to the muzzle device. There is a secondary retention latch that is depressed to remove the suppressor from the fast-attach mount. Accessory muzzle devices and other thread pitches are available. The Riton RT-S MOD 3 GEN2 1-4X24 Rifle Scope ($279.99) is our second generation, rugged all-weather scope specially for AR-15 platform. Accurate as you can be close in and mid range. 30mm one piece Nitrogen purged and sealed tube. It features: Full Wide Band Coating and Fully Multi-coated Optics, Low Light Enhancement Coating, 30mm One-Piece Tube, Push/Pull Locking Zero Reset Turrets, Aircraft Grade Aluminum with Rugged Design Ready for the Toughest Environments, 100% Waterproof, Fogproof and Shockproof, Dry-Nitrogen Purged and Filled, 1/2 M.O.A. Fingertip Windage and Elevation Adjustment, Fast-Focus Eyepiece, and it is Assembled in EP-Level Clean Room. Backed by The Riton Promise: Unlimited Lifetime Warranty. Crimson Trace CWL-101 Tactical Light For Rail-Equipped Long Guns [Keymod® / M-LOK® Attachment] ($69.99) Experience the power that effective illumination can provide. Introducing Crimson Trace Tactical Lights, a best-in-class family of tactical lighting products for rail-adapted long guns, backed by the Crimson Trace reputation you trust. The CWL-101 is a powerful rail-attached tactical light for M-LOK® or Keymod® rail-equipped long guns and provides up to 500 Lumens of white light. Riton USA is an American veteran-owned and operated optics company focusing on the most important people out there: you! Born in the heart of the Wild West, our company offers the highest quality optics at the most competitive prices matched with incredible customer service. We are dedicated to the PURSUIT of PRECISION in everything we do. Using only the best materials and most innovative technology, we have created an unrivaled line of optics that deliver on performance and value. 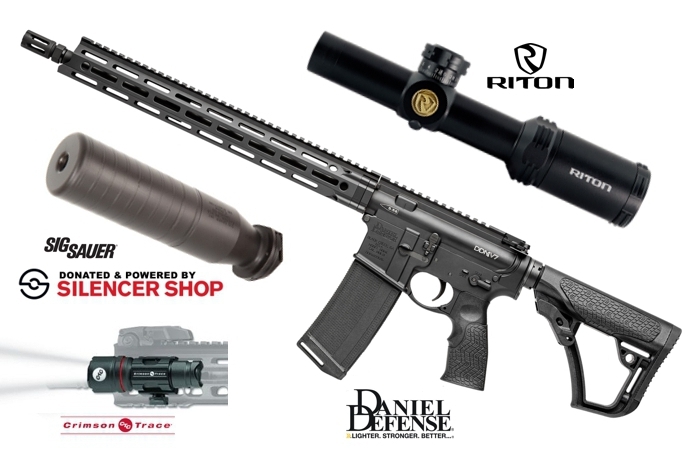 From offering you the best rifle scopes, binoculars, and red dot sights for your outdoor, hunting and shooting adventures to providing an unlimited lifetime warranty on every product we make, Riton always puts customers first. We promise to make the highest quality optics at a price point that hardworking people can afford. We will beat the competition on quality, warranty, customer service and value for money, every time. Riton USA was established in 2013 in “Optics Valley” Tucson, Arizona. Our mission is to provide you with the sharpest quality optics from the sharpest experts around: veterans and former law enforcement officers. Our company takes pride in employing those who have bravely served our country. We’ll get you ‘Riton’ target, it’s just up to you to choose the target.